High Gloss Blue Metallic is one of our newer finishes. Metallic colours in kitchens are becoming increasing popular through current trends. This colour should definitely be viewed in person for a true reflection of its shade. High Gloss Blue Metallic replacement kitchen doors and drawer fronts start at just £2.94. Click the button to request a free large sample swatch of Gloss Blue Metallic. 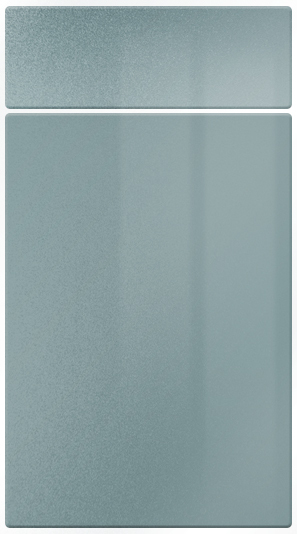 Click the button to purchase a Sample Gloss Blue Metallic finish kitchen door. The Gloss Blue Metallic finish is available in ALL kitchen door and drawer front designs. The Gloss Blue Metallic finish is available in MOST kitchen door and drawer front designs. There is also a large range of Gloss Blue Metallic accessories available. For example Gloss Blue Metallic cornice, Gloss Blue Metallic pelmet, Gloss Blue Metallic plinth/kickboards and Gloss Blue Metallic panels. Click the button to purchase a Sample Gloss Blue Metallic kitchen cabinet door.